No Churn Crunchie Ice Cream! Delicious, Sweet & Creamy No-Churn Honey and Caramel with oodles of Crunchies.. Mmmm, No Churn Crunchie Ice Cream! 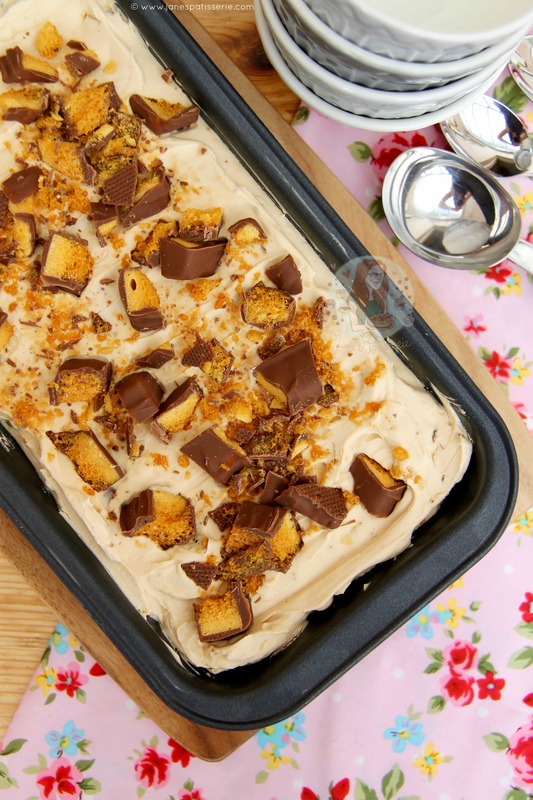 SO yeah, Crunchie obsession continues… It might be raining now, but it was very sunny when I made this! 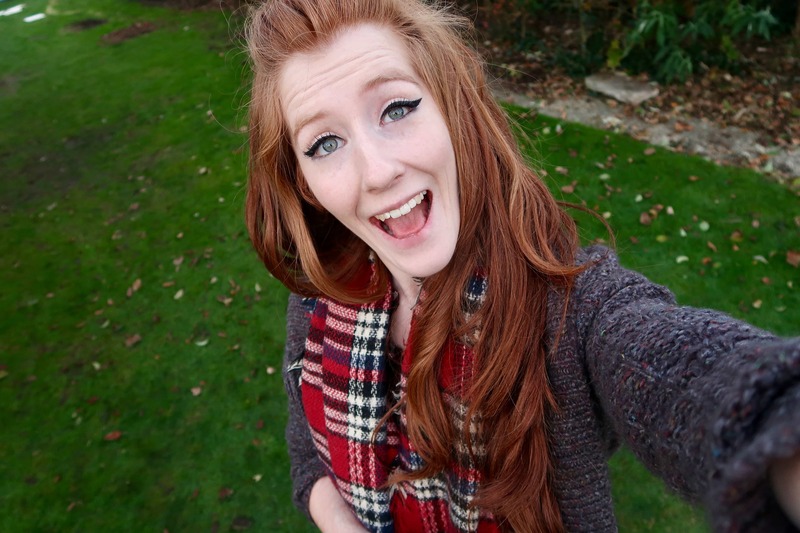 Like, so sunny I felt like I was melting whilst baking, so the Ice Cream had to happen. 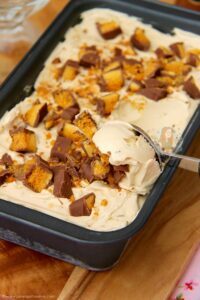 I have a good few Ice Cream recipes on my blog, but they’re never the most popular posts as they are Ice Cream after all, and as you can buy it so easily these days whats the point in making it? Well I disagree.. whether its churned, or No-Churn like this one, homemade Ice Cream is the bees knees. 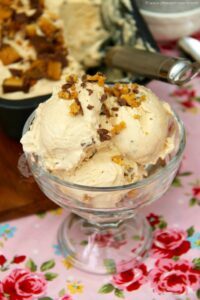 I based this recipe on my No-Churn Salted Caramel Ice-Cream as that also had a base of the Carnations Caramel rather than Condensed Milk like my others. However, with the addition of Honey and without the salt it made it taste slightly more honeycomb, and of course the Crunchies in every bite was damn delicious. I use a whole 600ml in my No-Churn Ice Creams as I find its the perfect amount so make it creamy, delicious, and still get enough Ice Cream to share at the end. 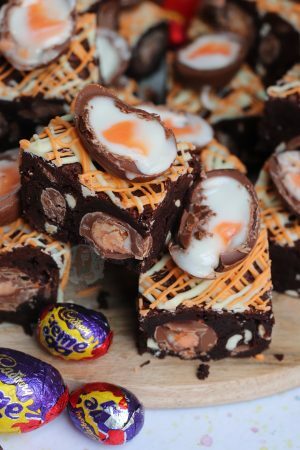 Even I would struggle to finish this whole batch to myself! One thing I will admit though is that it is SO VERY DIFFICULT to not just use this as a sauce on desserts, or like a cake filling, or just eat it out of the bowl without it even making it to the freezer as the whipped up version is a creamy, heavenly sweet treat that takes licking the bowl to a whole new level. 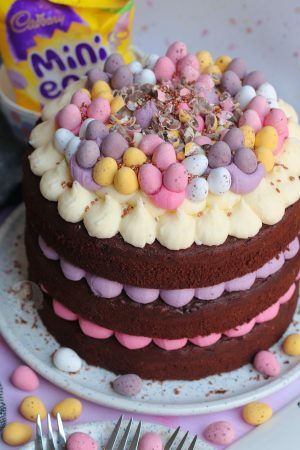 I purposely leave back a few tablespoons of the mixture to just eat as its so yummy, and yes I realise this is unhealthy but who cares, its totally worth it. This makes 2L of Ice-cream! 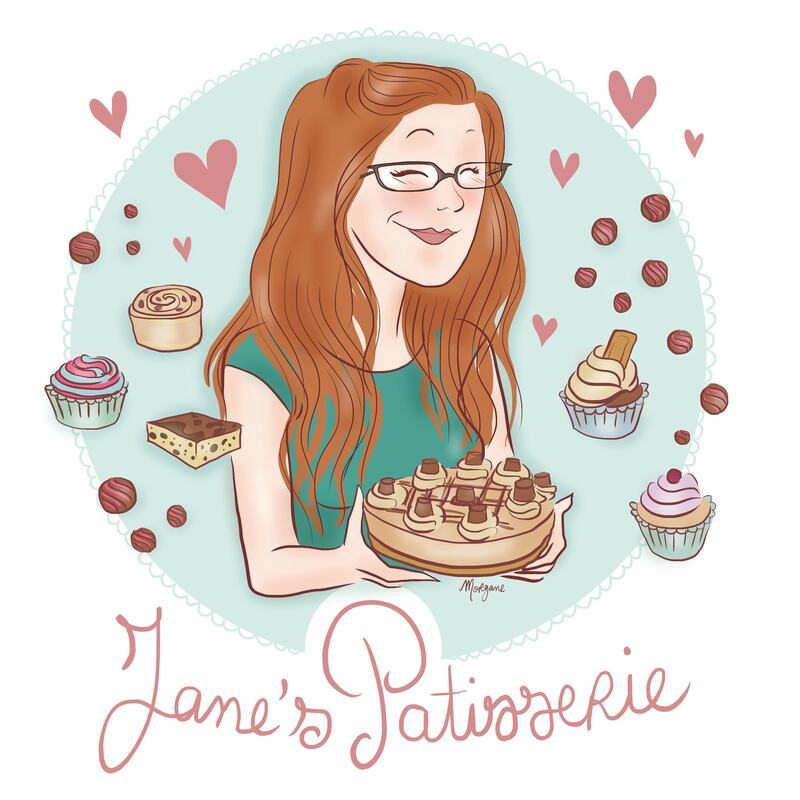 1) In a Stand Mixer with the whisk attachment (or a large bowl with a hand-held whisk) Whisk together the tin Double Cream, Caramel and Honey on a medium-high speed until smooth – can take a couple of minutes but its worth it! 2) Continue to whisk the mixture until its very thick and holds itself – fold through the chopped up Crunchie Bars. 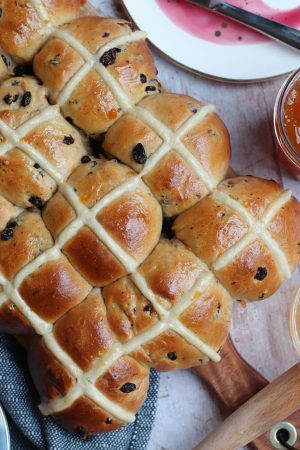 Pour into a freezer proof container or a 2lb Loaf Tin like in the pictures! 3) Add any extra Crunchie Pieces you have to the top, cover with a lid or some cling film and freeze for at least 5-6 hours, or over night! 4) To serve – remove from the freezer about 30 Minutes before you want to serve it – as its homemade and doesn’t have any nasty preservatives like most shop bought Ice Creams that are immediately scoop-able they’re a bit hard straight out the freezer! Serve how you like and ENJOY!! I use Cadbury’s Crunchie Bars as they’re my favourite and they are so readily available in England so they’re always in my cupboard. You can use any type of Honeycomb bar that you like, but chocolate covered honeycomb is best because then you get the bits of Chocolate too! 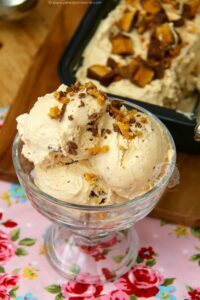 The Honey in the Ice-Cream is optional, it will work easily without it, but I adore the hint of the flavour along with the caramel and Crunchies – makes it even more Honeycomby! This will last in the freezer for 1 month! 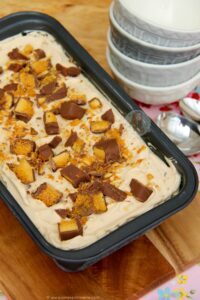 Find my other Crunchie & Ice Cream Recipes on my Recipes Page! Older Next post: Millionaire’s Crispy Squares! Newer Previous post: No-Bake Mint Aero Cheesecake! Without hesitation I’m making the honeycomb and the ice cream TODAY!! Woohóoo!! Thanks Jane you’re the ice cream whisperer.